Hope you are enjoying your fall. Can you believe it Christmas Holiday time is right around the corner? OK, I'll try not to rush the season. 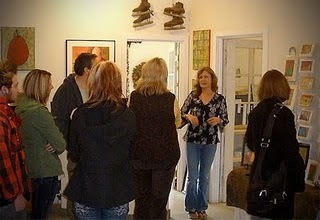 So in the meantime, been looking through photo shots of the recent Open Studio Tour and want to share a few with you. Krista and I had so much fun! Thanks to all of you who stopped by to visit with us. This is the best job in the whole world and it's because of you my dear friends and collectors! Thank you so much for all your encouraging comments and your belief in me and my creative efforts! 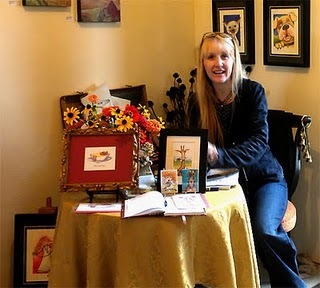 My creative Open Studio partner, Krista Cary and her fun loving art. What I do while the paint dries. 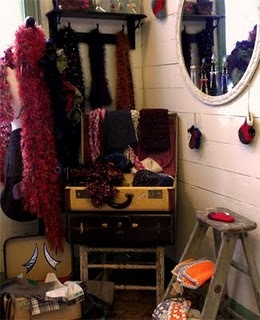 My handknit corner of the gift shop.